Dundee United say that Justine Mitchell has stepped down as a director as she wants to concentrate on the club's women's team and community involvement. The Scottish Premiership club issued the statement after discussing the matter at a Monday board meeting. But it did not shed any further light than her own social media statement. Mitchell is United chairman Stephen Thompson's sister and the news broke 24 hours after United lost Saturday's Scottish Cup semi-final to Hibernian. The Tannadice outfit are favourites for relegation as they are currently bottom of the Premiership, eight points adrift of Kilmarnock with five games remaining. Mitchell had said on Twitter: "I have resigned as director of Dundee Utd. 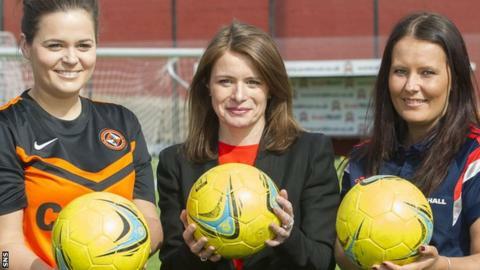 I remain a shareholder, fan & am committed to my work with the community and DUWFC (Dundee United Women's Football Club)." United said on Sunday: "The board of directors confirms it has received notification of intent to resign from Justine Mitchell. "This matter will be discussed at a previously arranged board meeting on Monday 18 April." Following that meeting, the club added: "Dundee United can today confirm the resignation of Justine Mitchell as a director of Dundee United Football Company Limited. "Justine has informed the board that she wishes to focus her efforts on the development of Dundee United Women's team and the club's community involvement."